Misconceptions are dangerous things. They shackle our visions of what’s possible and doom us to consequences we do not expect. For example, a student who believes her genes predetermine her academic abilities may avoid crucial learning experiences that are initially challenging. A student who believes his postgraduation success will flow from his intellectual prowess may gasp when he loses his first job due to interpersonal ineptitude. School leaders, especially, need accurate notions of how the world works if they want their school improvement efforts to succeed. Yet many bold and promising ideas to transform schools falter when leaders rely on conventional wisdom about how to make their initiatives flourish. Recently, my colleagues and I released a research paper that unveils common misconceptions about change management in schools. Given that many school initiatives falter for lack of teacher buy-in, we set out to uncover what actually causes teachers to change their practices. Using research methods based on the Jobs to Be Done Theory — an approach for identifying the causes driving demand for new products, services, and solutions — we asked teachers about the specific circumstances and events that led them to adopt new instructional practices. Our findings shed light on a number of widely accepted, yet inaccurate, change management ideas that often lead well-intended initiatives awry. The teachers we interviewed wanted to do what’s best for their students. But when school leaders extended this notion in the belief that student-centered strategies would have universal appeal, their approaches often ran afoul. For most teachers, proposed new practices are dead in the water unless they integrate with existing practices without excessive complication or hassle. This isn’t a selfish inclination. As teachers hone their craft year over year, they collect resources and strategies that build on what works. New strategies — no matter how good they may seem for students — cannot gain traction if they require teachers to radically change their methods. In short, most teachers buy what school leaders are selling only when new practices square with their practical reality. New initiatives always have early adopters — the teachers who are ready and eager to try out new practices. But it’s a mistake to assume that age or personality type is what makes someone an early adopter. Our research reveals that circumstances, more than personality traits, predict whether a teacher will be eager to jump on board. Teachers naturally seek new practices when they realize they need something better than the status quo. For example, a teacher of students with learning disabilities will naturally look for new ways to engage them when the default teaching strategies leave those students lost and acting out from frustration. The new strategies teachers pick are those that best address classroom challenges with a minimal amount of friction in transitioning from the old approach. In short, circumstances prime teachers to seek new practices; thus, any teacher can be an early adopter when the circumstances are right. Professional development consistently earns top billing in the list of essential elements for effective school change management. We don’t disagree with its importance. Unfortunately, even if teachers receive the best technical training in the world, that may not compel them to adopt a new approach. From a change management perspective, the purpose of professional development is not only to give teachers tactical knowledge on new practices but also to help them feel confident in the change management process. Most teachers won’t feel comfortable pulling new practices into their classrooms unless they feel assured that they’re going to be able to implement those practices effectively. For example, many of the teachers we interviewed said ongoing, job-embedded support is more important than workshops presented at the beginning of the school year or at the start of an initiative on how to use new tools or strategies. In short, effective professional development should address the stresses and anxieties that make teachers reticent to change. These misconceptions point to a general principle that explains why so many change management efforts miss their mark. When leading change, it’s easy to get wrapped up in the merits of a particular solution and lose sight of the people expected to adopt it. 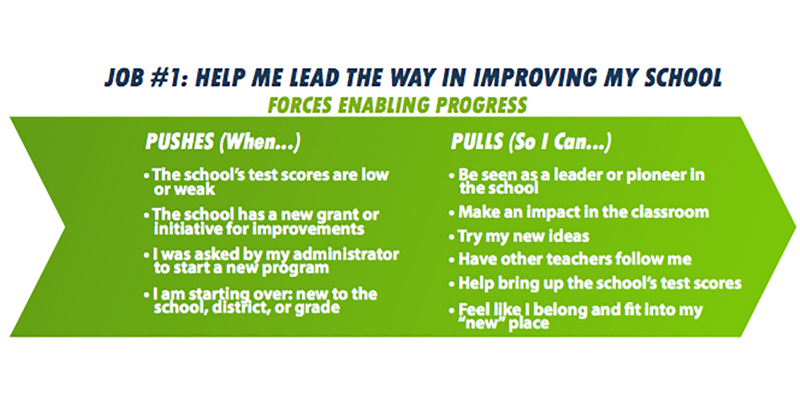 No new instructional program can impact student learning unless teachers decide to pull it into their classrooms. Thus, if school leaders hope to see teachers adopt new practices, they need to understand the circumstances their educators wrestle with on a day-to-day basis. Thomas Arnett is a senior research fellow in education for the Christensen Institute. Thomas Arnett is a senior research fellow in education for the Christensen Institute whose work focuses on the changing roles of teachers in blended-learning environments and other innovative educational models. He also examines how teacher education and professional development are shifting to support the evolving needs of teachers and school systems.